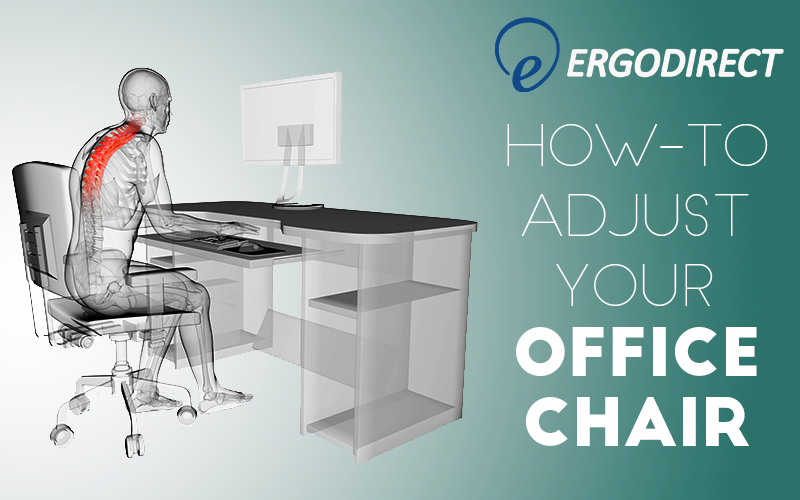 Welcome to the ErgoDirect Office Chair Adjustment guide. In this article, we will identify and describe what all of those levers and knobs are on your chair and explain how you should adjust each one to maximize the chair’s support. If you have just purchased a new chair or are looking to reconfigure your current chair, this guide will help you adjust it to fit you and your workstation. To get the most from these instructions, adjust your chair in the presented order. Chair Height adjusts how high the seat is from the floor. The goal is to have the user sitting where their knees are at just over 90° and their feet are comfortably resting flat on the floor. Your feet need to have a good grip of the floor so you can easily move your chair. Your back and quadriceps should be at just over a 90° angle as well. You should be able to reach your keyboard with relaxed shoulders and with your elbows at slightly more than a 90° angle. These are problematic situations to consider: a petite person at a tall desk and a tall person at a short desk. If you are petite and the desk is too tall, you may instinctively raise the chair up all the way so you can reach your keyboard. 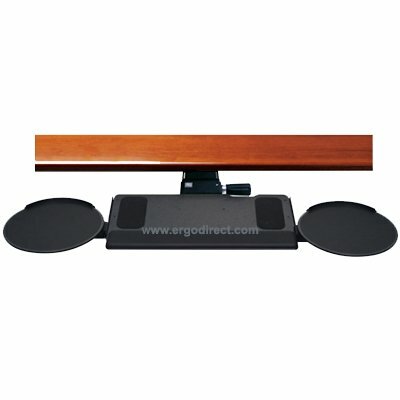 While this will make it easier to operate your desk, it is not ergonomically sound. Likely, the user’s legs and feet will be dangling – causing a lot of stress on their knees and lower back. Also, they’ll have minimal control of their chair which will make it difficult to scoot around. If you are experiencing this problem, you’ll need to raise your chair and use a medium height footrest or a tall footrest to support your feet. 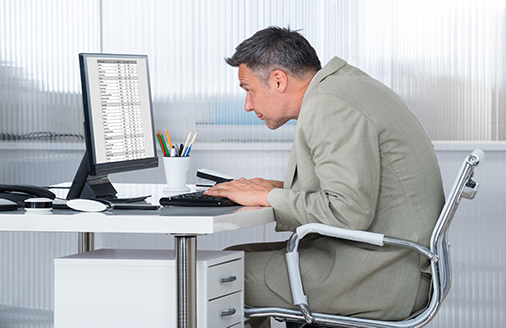 If you are a tall person working at a short desk, you’ll have to lower your seat so that your knees clear the low height of the desk. By doing so, most will end up in one of two positions. The first and most common position is where the user is extending their legs/feet far in front of themselves, which will cause stress/pressure under your hamstring. Sitting in this position puts a lot of weight on a small area located under your thigh. The second position is where the user awkwardly bends their knees to around 45° and places their feet are directly below the seat bottom. This is a very tense position that causes stress to the knees, lower back, and quadriceps. 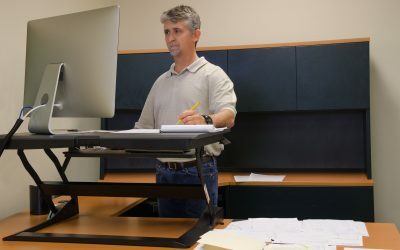 In this particular case, you’ll need to raise your desk a few inches off the ground using bricks or alternative leg support. 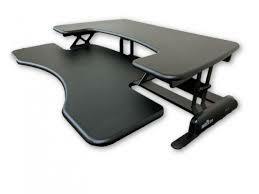 For best possible outcome, purchase an adjustable desk. Backrest Height adjusts the height of the chair’s backrest. First, check to see if your office chairs has a bulge towards the bottom of its backrest. If so, adjust the backrest height so the bulge fits in the contour of your lower back (or the lumbar region). If done correctly, you should feel the backrest evenly distributed across your back. If the bulge is too low or too high, you’ll feel a gap between your back and the backrest. Some backrests do not have a bulge so just adjust the height until your back’s weight is distributed across the backrest. If you are tall, you may want to consider checking out tall backrests to ensure your upper back/shoulders are supported while sitting. 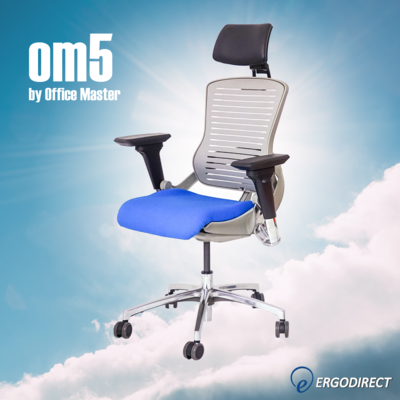 Lumbar Adjustment adjusts the depth of the lumbar support of the chair’s backrest. When adjusting, make sure that the weight of your back is evenly distributed across the backrest. If the lumbar adjustment is too shallow, you’ll feel a gap between your upper back and the bottom of the backrest. If the lumbar adjustment is too deep, your upper back will have to awkwardly hunch to rest on the backrest. There are two kinds of lumbar adjusters – hard or soft. Hard adjusters adjust by moving a piece plastic or similarly hard material. Soft adjusters adjust with a soft material like memory foam or padding. The soft adjuster is preferable, as it minimizes hard points that could cause long term back damage. Backrest Tilt adjusts the angle of the chair’s backrest in relation to the seat pan. You’ll want the backrest tilt to be at a just a little more than vertical (90°-95°) so the weight of your back is distributed evenly across the backrest. While many people like to recline their backrest, this usually forces the neck to compensate by bending downwards – causing stress on the upper spine/neck/shoulder area. Working in a reclined position also increases pressure on the tailbone, which can lead to coccydynia, a very painful condition. Seat Slider adjusts the depth of the seat in relation to the backrest. When seated, your legs should be supported by the seat leaving a few inches before your knee. In addition, make sure that the seat cushion is not touching your calves. If you are tall, you’ll most likely need to pull the seat slider away from the backrest to accommodate your quadriceps. If you are petite, you’ll likely need to push the seat slider towards the backrest so that your knees aren’t bumping up against the seat cushion. Seat Tilt adjusts the angle of the seat bottom. This can be adjusted for preference, but we commonly see that people prefer to sit level or slightly tilted backwards. Adjusting the seat tilt backwards forces the user to sit further back in the chair. By sitting this way, the user will get the most support. However, if the backwards seat tilt is too extreme, your feet will be lifted off the ground (in most chairs) and your neck will be tilted downwards. Rocking Tilt changes the seat tilt from a static position to dynamic positions allowing for constant tilt changes throughout the day. It allows you to kick your feet up and recline or lean forward. When activated, the rocking mechanism pulls the user forward and will add stress to your legs & lower back. Tension Knob adjusts the tension of your office chair’s rocking mechanism. If you have the rocking feature enabled, you’ll want the tension knob to be as tight as possible while retaining as much rocking function as possible. If it’s too tight, the rocking tilt will be too difficult to operate. Vice versa, too loose and you’ll end up rocking out like the image above. If done correctly, you should be able to adjust the rocking tilt of the chair by the location of your head – lean back and it will tilt backwards, lean forward and it will tilt forward. Forward Tilt feature tilts the entire chair forward in a sliding position. Depending on the task at hand, you may find yourself located off the back of the chair while leaning heavily forward. By activating the forward tilt feature, you can get back support needed while working in a hunched position. However, this is not advised unless the task at hand calls for it – ideal for the science and medical industries, especially dentists and lab workers.